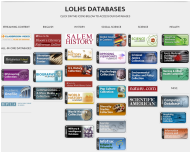 the Lyme-Old Lyme High School Library Media Center has a variety of resources for students and staff to utilize. All content is property of LOLHS-LMC. Please contact the LMS if you would like to borrow content.